In public, Presidents of the United States tend to describe their predessors with some dignity and respect. 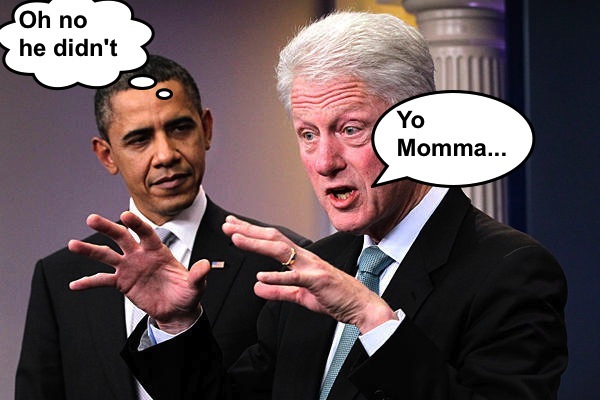 A new book reveals some of the true sentiments that Barack Obama and Bill Clinton have towards each other. Obama on Clinton: "I like him... in doses." Apparently these words came after the two couldn't finish an 18 hole game of golf back in 2011. "luckier than a dog with two dicks." "a barbarian who cannot write a sentence of grammar and can hardly spell his own name." "that infernal skunk in the White House." "McKinley has no more backbone than a chocolate éclair. "that's what happens when you play football too long without a helmet." Do we need a way for Presidents to sort out their differences? A Presidential fight club perhaps?